I’ve been making some very good use of pumpkin lately, and I’ve enjoyed every sweet minute of it. Several weeks back, my son and I went on a pumpkin pie “bender” and baked about four large pies over the course of a few days, as he had asked me if we could find a way to make our own completely-from-scratch pumpkin pie recipe. His request? No canned pumpkin, no pre-made pie crusts, and no whipped cream out of a spray can. 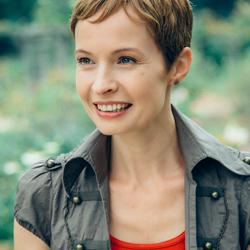 And me being overcome with joy at the prospect of spending time in the kitchen with my teenage son (happy momma! ), I was more than excited to oblige. Needless to say, it was pumpkin pie heaven here in our household, as the flavor and texture of those pies was unlike any store-bought version that we had ever sank our teeth into. But enough about those pies — I’ve digressed (actually, I’m just enticing you well in advance for next year). With this post, I’m here to talk cake! 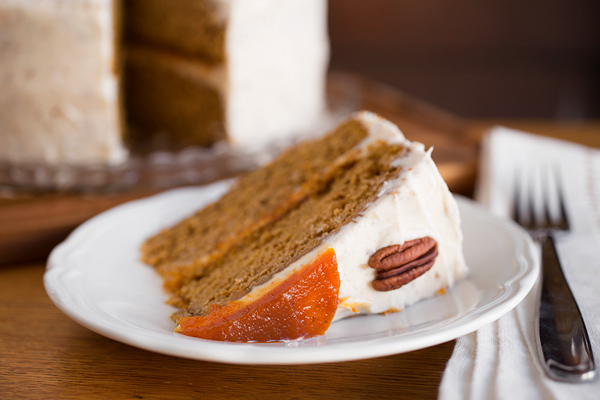 This year for Thanksgiving, I’ve decided to once again deviate from the traditional-but-delectable pumpkin pie when it comes to a pumpkin-y dessert and make it all about cake. And who doesn’t like a nice big slice of cake? Last year’s Spiced Pumpkin Parfaits were a delicioso and simple dessert-in-a-glass, but the thought of a spicy, moist pumpkin cake layered with pumpkin butter and spread thickly with vanilla-toasted pecan cream cheese frosting seemed like a sweet finish to this year’s T-Day dinner, if you ask me. I think it’s fairly safe to say that to not include a pumpkin dessert of some sort as part of the Thanksgiving Day spread would make most of us feel a little gypped, to say the least. One of the things that I love about pumpkin is how relatively neutral in flavor it is, and with its glowing orange color and it’s rich texture perfect for keeping everything that it’s added into moist, pumpkin is the perfect ingredient when melt-on-the-tongue velvety-ness is what you’re after, and it doesn’t get much tastier than in a piece of cake. 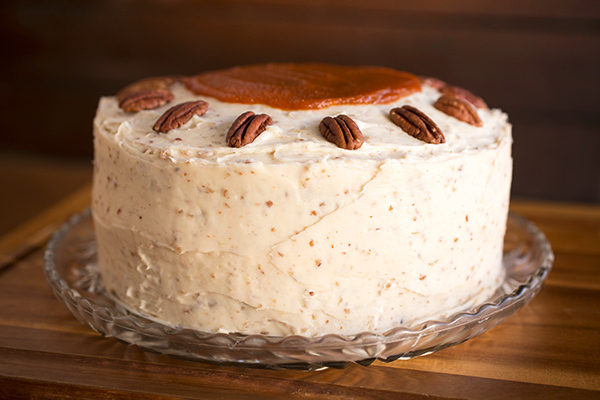 Sweet butter, heaping amounts of warm spices, brown sugar and fragrant vanilla come together with pureed pumpkin to create a soft, tight-crumbed velvety cake perfect for a decadent dessert anytime during the fall, and particularly as a yummy finish to a festive meal. 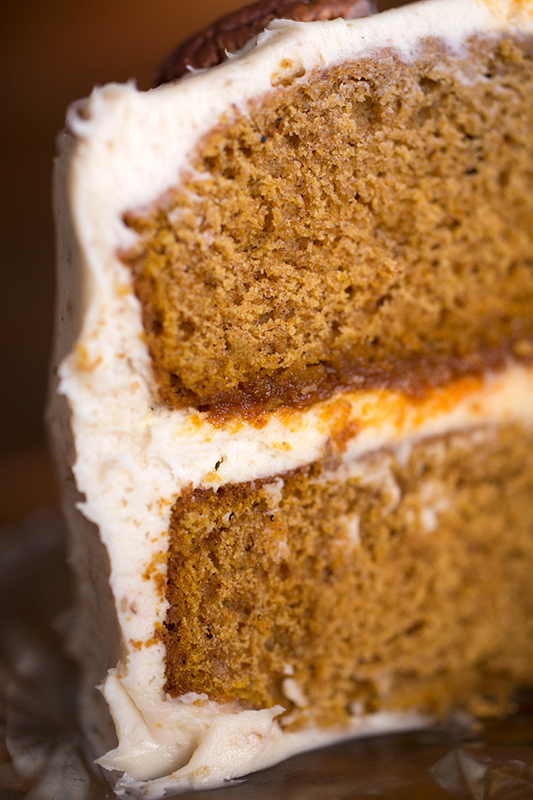 This Spiced Pumpkin Velvet Cake is going to be my tasty little friend this Thanksgiving’s eating season, as the deep spicy flavor combined with sweet, rich creaminess is one that’ll impress any guest with even the most voracious sweet tooth. 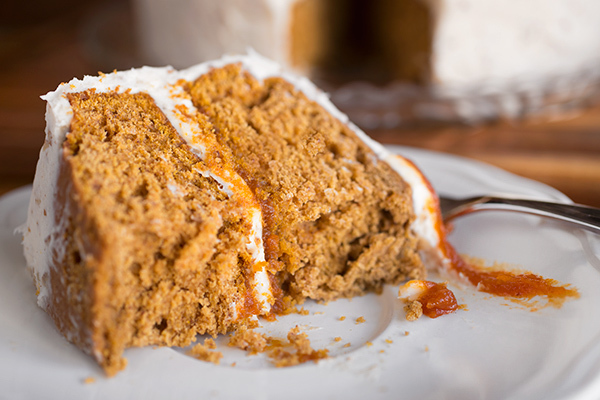 And though pumpkin pie is a classic that we all know and love (and even go on an occasional “bender” with, eh-hem), taking those same familiar flavors and whipping them up into the layers of a moist cake is certainly another comforting way of expressing our deep love for pumpkin. And love it we certainly do. -Preheat the oven to 350°, and mist two, 9” cake tins with cooking spray, or grease with butter, and line the bottoms with parchment paper (you can also prepare this in a bundt pan, as well, but you’ll need to double to baking time). -Prepare the dry ingredients by whisking together the flour, baking soda, baking powder, salt and pumpkin pie spice in a bowl; set aside for a moment. -In another large bowl, add the brown and granulated sugars, the eggs, the pumpkin puree and the vanilla extract, and using a hand mixer, mix on medium until all ingredients are smooth and well combined; next, add in the melted butter, and mix that in until that is well incorporated. -With you mixer on low, slowly add in about 1/3 of the dry ingredients, and once those are incorporated, add in another 1/3 and mix, then the remainder and mix just until smooth and well blended. -Pour the batter evenly between the two cake tins, and bake the cakes for 28-30 minutes, or until a toothpick inserted into the center comes out clean; allow the cakes to cool in their pans for about 10 minutes before turning them out to completely cool. 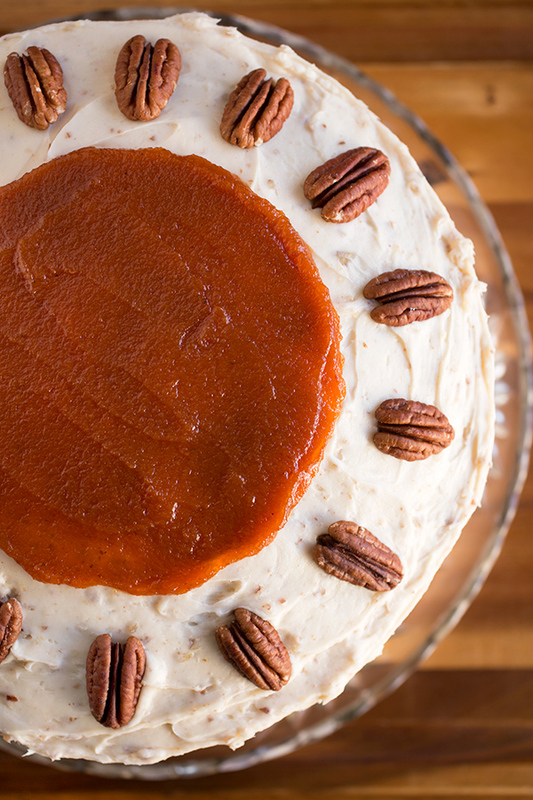 -Once cooled, cut any excess “dome” shape off the tops if desired (just enough to help create a flatter surface), and place the first cake layer, with its flat, bottom-side up, in front of you; spread a generous amount of the Vanilla-Toasted Pecan Cream Cheese frosting over that layer, followed by about ½ cup of the pumpkin butter, spread thinly over the frosting; place the next layer of cake over that one, and once again with it’s flat, bottom-side up, frost this top layer generously (plus the sides of the cake) with the frosting; next, add the remainder of the pumpkin butter decoratively to the center of the top of the frosted cake and spread, and garnish with pecans to indicate where each slice will be. -To a large bowl add the softened cream cheese and the butter, and with a spatula, smooth and combine the two together just a little bit; then, using a hand mixer, beat the two together just until smooth and fluffy; next, add in the powdered sugar, one cup at a time, and beat that in until well blended; add in the vanilla, and beat that in just until incorporated. -Finally, fold the finely processed pecans into the frosting using a spatula, just until well combined; cover and store in fridge until ready to use. I cannot find pumpkin butter. Do you have a recipe? Hi Michelle, typically they carry pumpkin butter in the section of the grocery store where the preserves/jams/jellies are – it’s a fruit “spread”. 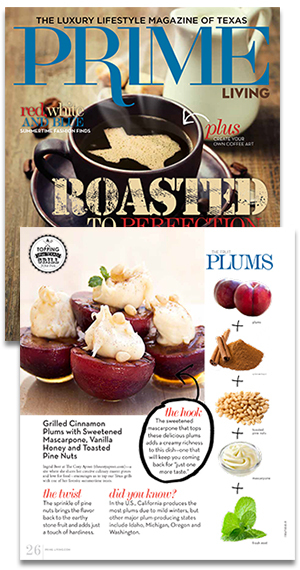 Since I purchased mine, I don’t have a recipe of my own for it as of this moment, but you can check out this link for a good homemade one: http://goo.gl/180gAM You can also just omit it altogether – it’s just a nice little added touch of flavor, but can be optional. Oh goodness this looks so heavenly! I always roast my own pumpkins. It’s so worth it. This cake looks worth every moment of preparation and calorie too. Hi Laura, home-roasted pumpkin certainly has the most intense flavor, doesn’t it? Thanks so much for your comments! 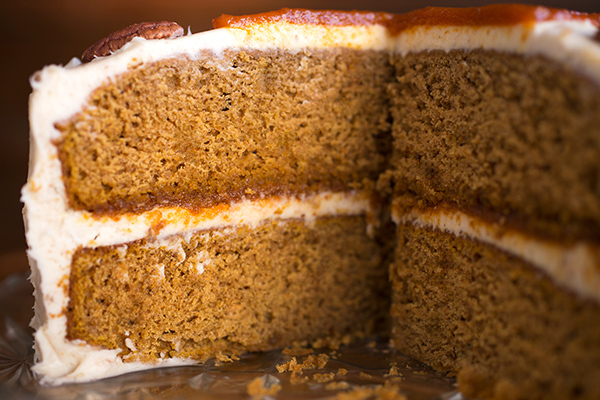 You add a 9 ounce jar of pumpkin butter to the cake or frosting, can’t tell where to add it or use it. Hi Doris, it is written in the recipe instructions in the last section where I describe how to frost the cake, just above the frosting ingredients. You add some over top of the frosting on the first layer, and then on the second (and top) layer, you add it only to the center, decoratively, as pictured in the photos. Hope that helps!